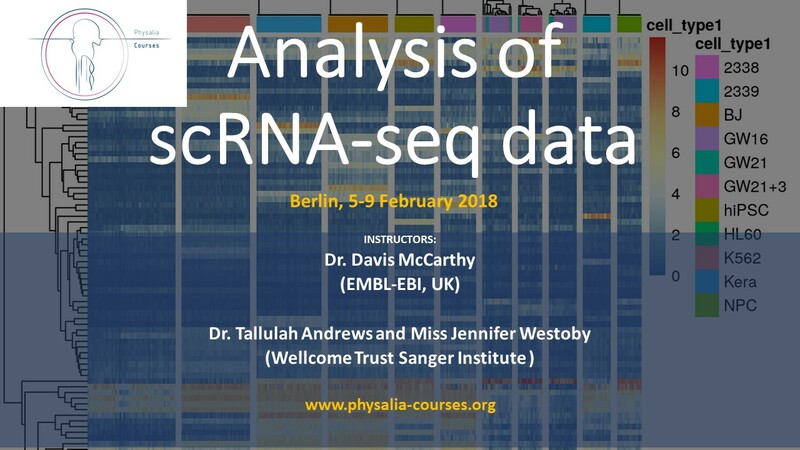 we have the last spots left for the course "Analysis of single cell RNA-seq data", which will be held in Berlin from the 5th to the 9th of February 2018. In recent years single cell RNA-seq (scRNA-seq) has become widely used for transcriptome analysis in many areas of biology. In contrast to bulk RNA-seq, scRNA-seq provides quantitative measurements of the expression of every gene in a single cell. However, to analyze scRNA-seq data, novel methods are required and some of the underlying assumptions for the methods developed for bulk RNA-seq experiments are no longer valid. In this course we will cover all steps of the scRNA-seq processing, starting from the raw reads coming off the sequencer. The course includes common analysis strategies, using state-of-the-art methods and we also discuss the central biological questions that can be addressed using scRNA-seq. The course will be delivered over the course of five days. Each day will include an introductory lecture with class discussion of key concepts. The remainder of each day will consist of practical hands-on sessions. These sessions will involve a combination of both mirroring exercises with the instructor to demonstrate a skill as well as applying these skills on your own to complete individual exercises. After and during each exercise, interpretation of results will be discussed as a group. Computing will be done using a combination of tools installed on the attendees laptop computer and web resources accessed via web browser. This course is aimed at researchers and technical workers who are analyzing scRNA-seq data. The material is suitable both for experimentalists who want to learn more about data-analysis as well as computational biologists who want to learn about scRNASeq methods. Examples demonstrated in this course can be applied to any experimental protocol or biological system. The course is intended for those who have basic familiarity with Unix and bash and R scripting languages. We will also assume that you are familiar with mapping and analysing bulk RNA-seq data as well as with the commonly available computational tools.